Tune In / ATAR612 God is walking in the garden (David Brown) A gentle song that starts in the Garden of Eden and ends with Easter. "We heard you walking, We hid because we're afraid". A great song for the start of Lent. Reference recording, lyrics and songbook. Tune In / ATAR663 Save us in the time of trial (Shawn Whelan) A song with a reflective almost-Taize-like chorus. We have sung this a cuople of different ways, it's quite flexible. I will suggest this quite a bit during Lent, so this might be a good time to teach it. Lyrics, sound sample and songbook available. MV150 Spirit God be our breath (Bruce Harding) A lovely gentle song, with a nice descant part. Comforting. STB269 God of the galaxies spinning in space (Shirley Murray) Excellent words about our beautiful creation, and our call to care for it. Chorus is "Let us care for your garden and honour the earth". It has 5 verses, so get the congregation to join in as they learn it. NCH568 / PH283 God marked a line and told the sea (Troeger) Sung to the familiar hymn tune KEDRON, this hymn is a song about limits and how to define freedom. "God set one limit in the glade where tempting, fruited branches swayed". Would be great to initiate a discussion. *CH171 / A&M568 / SP253 Take up the song and sing the praise of God (Whitney) Simple, upbeat tune, and great words about creation, our choice and responsibility. Nice time signature. NCH559 / PH266 / W&R36 Thank You God for Water Soil and Air (Wren) Good words asking God's forgiveness for the way we have damaged the planet we have been entrusted with, and a plea to help us renew the face of the earth by caring for creation. A prayer of confession. 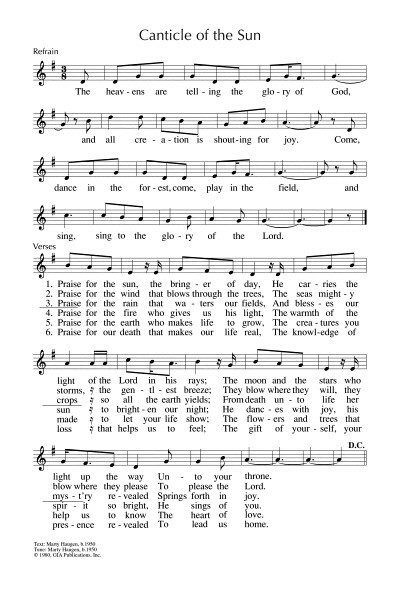 Can't tell you much about the tune, because I don't have these hymnals and can't find it on the internet anywhere. Lyrics. TiS 668 / AoVK-34 / ATFG587 / NCH569 / CH243 / VU307 / R254 / ELW739 / AA143 / A&M553 / GtG713 / G(3)805 / W&R38 / Cha693 / URW189 / StF729 Touch the earth lightly (Murray) Sings of the redemption of creation and our complicity in its destruction. Sources vary in their set tunes. TiS has a good tune (TENDERNESS) with a nice minor key change to the relative minor for the second verse. Can also be sung to BUNESSAN, if you need a familiar tune. Youtube video with all lyrics. New words to old tunes (if you want). VU248 / StJ / WoV799 / ELW861 / CP307 When long before time / The Singer and the song (Davison) Easy tune. Nice imagery of God the Singer and Song Incarnate. *CH244 / FFS75 Where are the voices for the earth? (Murray) Very very nice. Haunting tune. While the harmonies are complex, I don't think this is hard to sing. TiS 159 / AHB 94 / CH226 / VU300 / R252 / ELW734 / CP261 / CP(E) 271 / StF122 / Lau733 God whose farm is all creation (Arlott) Simple words of caring for the crops and harvest as well as well as all creation. Lyrics. PH266 / W&R36 Thank You God for Water Soil and Air (Wren) Good words asking God's forgiveness for the way we have damaged the planet we have been entrusted with, and a plea to help us renew the face of the earth by caring for creation. A prayer of confession. Can't tell you much about the tune, because I don't have these hymnals and can't find it on the internet anywhere. Lyrics. God knows us better than we know ourselves. We cannot hide. AoV2-031 / ATW 424 / CH97 / A&M747 / GtG029 / GC(II)509 / SP301 / StF728 / Lau779 O God, you search me and you know me (Farrell). My favourite version of Psalm 139, which fits this reading too. The tune flows effortlessly and it has a nice little hook at the end of each verse. Sample music and lyrics here. *CH145 God made me as I am (Farrell) A lovely little song. "God made me as I am, part of creation's plan. No-one else can ever be the part of God's plan that's me". Good for kids. NCH Psalter 139 is a very simple refrain for this Psalm from Jane Marshall, which is worth a look. SP&P084 You know my words before they’re said / All My Days (Zelman) A good contemporary version of this song. It would be good sung by a soloist at first. PfAS139C Lord you have searched me and you know (Hopson) A very simple refrain for a responsive reading or chanted reading of this Psalm. *ATW 487 Make your home in me A simple beautiful invitation. Written by Melbourne songwriter and teacher, Fay White. “If you fly to the point of the day’s sunrise or westward across the sea, if you travel to the uttermost ends of the earth, there I will be; Make your home in me as I make my home in you. I am everywhere that you can be. Make your home in me”. This is quite different to the Vineyard / Josh Young version you can find all over the internet. I can't find a sample of this one, unfortunately. Taizé / TiS 725 / ATE 275 / AoV2-167 / ATE 275 / StJ / GA538 / GtG678 / G(II)553 / GC763 / URW391 In our darkness there is no darkness in your sight, the deepest night is clear as the daylight (La tenebre). Also translated as "Our darkness is never darkness". Sample music and lyrics. STB008 Come Lord Jesus Christ / Esho hae Probhu (Bangladesh) (Shaha) A good chant to sing in times of darkness. It has words in English and Bengali. The tune will need to be taught. *Music by Heart 15 Darkness is not dark (Law) A simple round, with optional cantor part. Good to teach to your congregation without lyric sheets or projections. Would be appreciated by kids, as it is simple. Good for kids. AoV2-079 / GA081 How Rich Are The Depths (Willcock) A good Cantor and refrain version of the Psalm. *Worldmaking.net Open unto me light for my darkness (Richard Bruxvoort-Colligan). This is really lovely and meditative. Sample here. Linnea Good: Psalm 139: Where Can I Go? “Where can I hide from your Spirit? Where can I run from your presence? Where can I go, when you are always there?” A simple refrain. Worldmaking.net God of My Breathing (Bruxvoort-Colligan). Excellent words to a well-known hymn tune (BUNESSAN). Sample and lyrics. New words to old tunes. SP&P89 / Worldmaking.net Ground and Source of all that is (Bruxvoort-Colligan) This song is very beautiful and easy to sing. Lyrics and sound sample. TiS 182 / AoV2-010 / NCH11 / CH134 / VU268 / GtG760 / SFFS 2047 / HPP13 / CP395 Bring many names beautiful and good (Wren) This is a beautiful song, but it's very long (especially if sung too slowly). Try singing one verse unison, then one women, one men, then all together again, to keep people interested in what they are singing. Lyrics and sample sheet music. TiS 387 / CH416 / UMH318 / VU158 / LBW363 / ELW389 / A&M199 / GtG246 / PH108 / CP(E) 140 / W&R312 / 82Hml-182 / Lau272 / StF297 Christ is alive Let Christians sing (Wren) Excellent words of Christ's saving, and still relevant grace. A couple of tunes are offered in different hymn books. I prefer TRURO. Lyrics, sound sample and sheet music. New words to old tunes. NCH70 / UMH660 / VU389 / WoV719 / ELW526 / A&M445 / HPP486 / GtG409 / PH461 / GC741 / GC(II)737 / G(3)843 / CP(E) 301 / W&R1 / Cha280 / STB049 / StF025 God is here as we your people (Pratt Green). Great lyrics, but not inclusive in all sources and set to a range of tunes. I like it sung to the familiar tune ABBOT'S LEIGH. Lyrics, sound sample and sheet music sample. New words to old tunes. Iona (One is the Body) / ATAR601 / MV103 Ka mana'o 'i 'o (Camacho) Hawai'ian song. Fun to sing and good words. The chorus is not too hard to sing in Hawai'ian if you teach it. Nice with guitar and/or ukelele. Note for BUC: We have two ukelele players in the congregation. Sound sample. NCH398 / MV044 / W&R599 / URW072 Shadow and Substance (Damon) Good clear words of being Christ's community in all our diversity. A simple tune. Sample sheet music. Here in this place As we live and have our being (Wiltshire) Lovely words to one of my favourite scripture verses, focused on God in all our life and action. Suggested tune is FELICITY. Download songbook here for free. GtB God is love and love is giving (Langmead) A simple kids' song about God's love. A round. Good for kids. *Iona (M&G) / ATAR609 / CH359 / MV033 / GtG137 / ZSS54 / StJ / ELW253 / GA293 / SFFS 2085 / G(II)276 / GC370 / GC(II)364 / G(3)429 / CP368 / W&R402 He came down that we may have love/ Jesus came bringing us hope (Traditional Cameroon) A lovely simple song - you can make up words and have a lot of fun with this if you also use some drums. Scottish sound sample. Good for kids. Tune In: In the shape of a cross (Dave Brown) A cry to God for help and a call for God to enter our world. Reference recording, lyrics and songbook. TiS 242 / AHB 183 / AoV1-018 / ATN 27 / CH404 / UMH261 / VU352 / A&M667 / HPP163 / GtG157 / PH302 / G(II)481 / GC708 / GC(II)689 / G(3)796 / CP(E) 468 / W&R118 / Lau765 / StF247 I danced in the morning / Lord of the Dance (Carter / SIMPLE GIFTS). Lyrics and tune sample. You all know this one, right? Good for kids Oldy-but-a-goody. *Taizé / CP530 By night we hasten in darkness / De noche (Berthier) One of my favourite Taize chants. Sheet music, lyrics, translations and sound samples. *NCH297 / CH736 / VU706 / StJ / AA45 / HPSS528 / W&R518 / Cha649 / URW131 Give thanks for life the measure of our days (Murray) This song is also good for funerals and is sung to the familiar tune SINE NOMINE. "Give thanks for life, the measure of our days, mortal we pass through beauty that decays, yet sing to God our hope, our love, our praise: Alleluia, Alleluia!". Lyrics (scroll down). New words to old tunes. *Online Resource Holy Holy Holy One (Bruxvoort-Colligan) An energetic rocky song about God's love. Sound sample, lyrics etc. *Taizé / MV100 / Lau782 Lord God you love us, source of compassion (Berthier) A very simple refrain, which would work well as a response during prayers of confession or of intercession. Sound sample, sheet music and translations. TiS 174 / UMH194 / A&M544 / CP(E)259 / 82Hml-585 / StF012 Morning glory starlit sky (Vanstone / KENOSIS) Quite formal words, but very very beautiful song of God's boundless love "Drained is love in making full, bound in setting others free, poor in making many rich, weak in giving power to be". Not all sources are inclusive. The tune is not difficult, but will need to be taught to a congregation if not familiar. The lyrics could also be read as a poem, and challenges the image of Christ as monarch, but also affirms God's reign. Lyrics. AoV1-003 / HPP258 / GA394 / G(II)342 / GC497 / GC(II)495 / G(3)576 / Lau693 / StF803 / MP648 The heavens are telling the glory of God / Canticle of the Sun (Haugen) Energetic waltz of cosmic praise with great lyrics "Come dance in the forest, come play in the field, and sing, sing to the glory of the Lord". Sound sample. Lyrics and sheet music sample. NCH271 / UMH538 / VU196 / PH131 / CP249 / W&R333 Wind who makes all winds that blow (Troeger) Excellent words. Familiar tune (ABERYSTWYTH). New words to old tunes. Various Sources Blowin' in the wind (Dylan) Thanks to Ed in LA for this suggestion. "The wind blows where it will". This could be a good song to add to this reading. TiS 755 / ATA 196 / CH804 / VU884 / SFFS 2278 / A&M484 / HPP219 / GTG080 / CP772 / W&R710 / SP82 / Srcs830 / URW449 / Lau878 / STF487 / MP796 You shall go out with joy / The trees of the field (Dauerman) This is a good hand clappy foot stomping song. Fun. Good for kids. Oldy-but-a-goody. *URW450 For you shall go out with joy (Don Saliers) A fun song for group singing; this, and the last line, will need to be taught to four groups in your congregation, who each repeat their simple line over and over. Particularly good for less formal services or to involve all ages; it could be taught during the children's talk, along with a conversation about what it might mean. No projections or pewsheets needed! NCH313 Like a tree beside the waters (Martin) Good congregational words of richness from the waters. Tune is a little bit tricky, so will need to be introduced. It can also be sung to the more familiar HYFRYDOL. TiS 671 / AoV2-121 Made in God's Likeness (Patricia Lewis / Alister Spence) Excellent Australian imagery. This is one of my very favourite songs. It is not difficult if you have a good musician at the helm. If it is new to your congregation, they will be able to join in on the verses by the time you get to the 3rd one. The change in tone with the verse really lifts this song. Lyrics and sound sample. I had an interesting discussion with a friend at church who doesn't like the line "Called to create a new world for the Lord", and I realised that I was interpreting the line quite differently to her. I think of it as a world being created that is "for God", like when you vote for someone. Online Resource Imagine now our world renewed (Wiltshire) A song of prayer for healing of our beautiful earth. Free download. FFS63 These hills where the hawk flies lonely (Colin Gibson) This is a really beautiful song that would work well for all the Seasons of Creation Sundays. For this reading the phrase "Forests where the tree ferns tower" is a particularly nice part. Lyrics & sample sheet music. I first learned The Tree Song from Faye White - she recorded it on a cassette album called "Trees, Stars and Other Wonders" that was commissioned by, I think, the Victorian Education Dept for use in primary schools - songs with a spiritual flavour rather than overtly Christian. However, Bruce (my husband) tells me that Amy Grant also recorded it, so I suspect that you were exposed to it from one or both of these sources. On further reflection, I think it was on an old Evie Tornquist cassette.